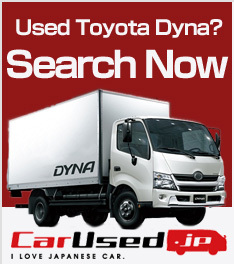 Dyna is a Toyota light truck model with a long history that began with its release in 1956. 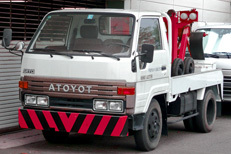 It continued to be sold afterwards, and after Hino Motors joined the Toyota Group, they deepened their relationship in the light truck category as an OEM supplier. They developed the 7th generation, and the current 8th generation which was released in 2011 is an OEM car supplied by Hino Motors. The 8th generation features improvements in fuel efficiency, steering, and safety. There are 4 and 5 speed manual transmissions, and automatic transmission is set to 6 speeds. The truck is equipped with an economic run system that displays instant and average fuel consumption and cruisable distance to aid in fuel efficient driving, and also has an idling stop function. On the steering and safety front, the front pillar was made narrower while maintaining its strength, allowing for an increased field of vision through the front glass. The newly designed cab also comes equipped with a wide view mirror that provides an extensive view of the sides, minimizing blind spots and preventing accidents. There are not only models with a maximum loading capacity of 1 ton and 2 ton, but also a 3 ton model. There are 2 ton panel vans, flat bodies, dumps, and a car carrier truck with a 3 ton maximum loading capacity in the line-ups of rental businesses such as Toyota Rent-a-Lease. However, following changes to the licensing system on June 2nd, 2007, some Dynas may no longer be operated with the new ordinary license. Among the 3 ton trucks there are not only car carrier trucks, but also flat bodies that are as short as the 1 ton trucks. Drivers with a new ordinary license cannot use the Dyna T4 Class at Toyota Rent-a-Lease.